The combination of a blank standard round stud and FDX RFID tag allows visual and electronic identification. Visually and electronically identify your animals fast with a combination tag set. The combination of a blank standard round stud and full duplex (FDX) electronic ID tag allows you to both visually and electronically identify your animals fast. A great solution to minimize the amount of tags needed for your pigs while being able to comply with any EID tag requirements you may need to meet for a show or event. The unique AIN (Animal ID Number) printed on the RFID tag is designated by the manufacturer. This tag combination is not tamper evident. The female button tag is only 1.2" in diameter which allows room for other standard visual ID tags to be used if needed. The matching yellow blank standard round stud is 1.1" in diameter, leaving room to clearly write in an animal identification number if desired. Destron Fearing™ tags are coated with Infecta+Guard® to prevent infection after application. Flexible polyurethane construction carries a lifetime warranty and offers outstanding resistance to cold weather and harsh conditions. 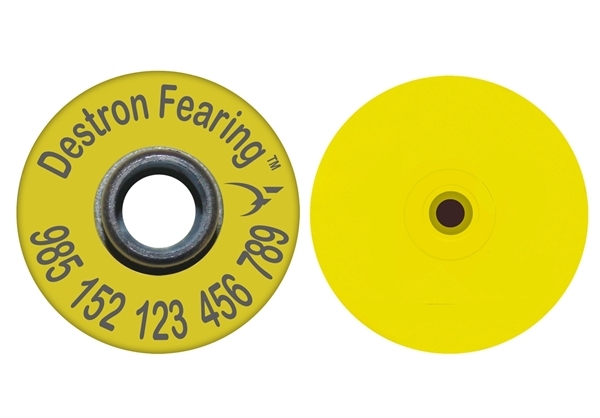 Use the Destron Fearing™ Progrip™ Applicator to quickly apply ear tags on your animals and the EZ Knife™ for quick, safe removal. Unique management ID numbers and symbols can be permanently added to the tag using the Destron Fearing™ Super Mark™ Pen which contains special ink that absorbs into the tag material. Infecta+Guard is self-activating upon application of the stud. Store in a cool, dry place. Do not allow stud to be exposed to moisture prior to application. 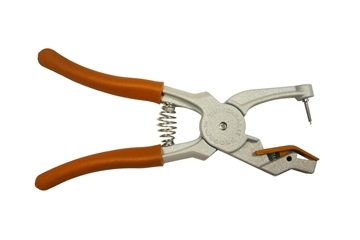 Use the ProGrip™ 2 applicator to quickly and accurately attach animal ID tags to livestock. The Super Mark™ Pen contains special ink to permanently mark Destron Fearing™ animal identification tags. 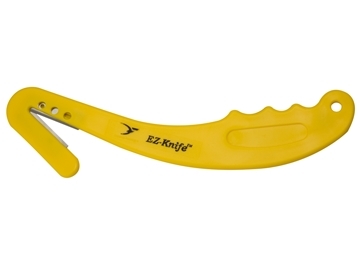 Use the EZ Knife™ to quickly, safely and easily remove animal identification tags.